Do you ever stop to wonder how you got where you are? 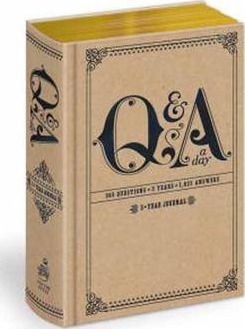 The Q&A a Day Journal shows you what was going through your head each day--for five years of your life. Simply turn to today's date, answer the question at the top of the page, and when you finish the journal, start over. As you return to the daily questions again over the years, you'll notice how your answers change, or don't! With questions that are sometimes provocative ("On a scale of one to ten, how happy are you? "), occasionally quirky ("What can you smell right now? "), and inevitably interesting ("If you could travel anywhere tomorrow, where would you go? "), this classically designed journal--embellished with beautiful details--is the perfect gift for anyone embarking on a new phase of life. 365 questions. 5 years. 1,825 answers.